Come and visit our stand (1C09) at this year's CV show. 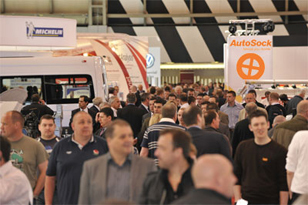 Without question, the CV Show is the largest and most comprehensive road transport event staged in Britain, catering for every operator's requirements. From heavy trucks to car derived vans, temperature controlled transport to waste disposal and street cleansing, the CV Show is the best sourcing opportunity found anywhere in the UK. "If the right people carried AutoSock there'd be no excuse for the roads being blocked by vehicles when the snow falls faster than it can be cleared. We have a simple and effective solution and feel a real responsibility to try and get the message out. When we were here in 2008 there was lots of interest, but because it hadn't really snowed for so long, these weren't products that people thought they'd need. But after the last two winters, that's all changed! There seems to be a real determination not to get caught out again."